Today I’m writing this review on one of Dr. Sam Robbin’s most popular weight-loss products, the Lean Optimizer. During the month of March, you’ll get 10% off this number-one bestselling supplement since 1999. Spring is in the air, and it’s time to start losing those stubborn pounds by summer. Is Lean Optimizer just one of many weight-loss fads on the market today, or is it really possible to lose fat with this program? Let’s get into it. What Is The Lean Optimizer Program? Did you know that losing weight tops the list of New Year’s resolutions hands down? You know the battle of the bulge is real if you’re on the opposing side. 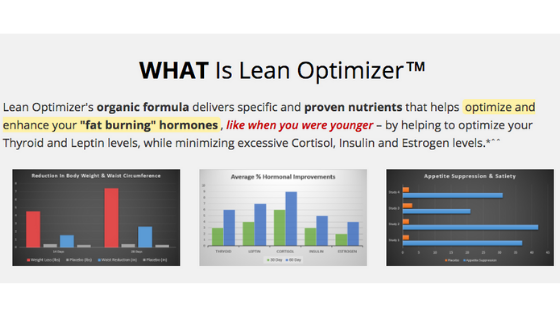 One of the reasons I like Lean Optimizer is the focus on optimizing fat-burning hormones, rather than harping on eating less and exercising more, which is an outdated model. Of course, there are no substitutes for a nutritious diet and targeted exercise routine, this program however purports to burn fat, suppress appetite, and boost metabolism when used in conjunction with these healthy habits. Hormonal imbalance is an underlying factor that contributes to the inability to lose weight. Hormones decline with age, and can become dysregulated by poor diets, sedentary lifestyles, environmental toxins, and stress, including physical, emotional, mental, and structural stress. Lean Optimizer is a natural supplement with a proven track record in terms of its effectiveness and safety. This organic formula contains nutrients that enhance and optimize fat-burning hormones that promote weight loss. These hormones include: cortisol, leptin, ghrelin, adiponectin, insulin, estrogen, and thyroid. Ideally, you want all these hormones working together in tandem, like a harmonious symphony. As we get older, we need a little boost to augment our diet and exercise programs. We can do this by adding in critical nutrients that prevent homeostasis, tricking our bodies from quickly adapting to our new routine. 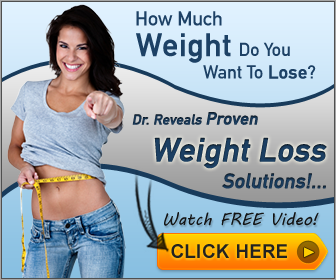 This enables weight loss to continue unimpeded. Kind of like when you were in your twenties, and were able to lose weight by simply exercising more or cutting out sugar. With the right strategies, weight loss was effortless because your hormones were behaving as they should. The goal of the Lean Optimizer program is long-term fat loss. People worldwide have lost countless pounds by dieting, but when it comes to keeping those pounds off, they failed. Much of the weight they lost was water weight and muscle mass, which is crucial for an optimally functioning metabolism. Unfortunately, this scenario is the result of adaptations within the body that negatively impact hormones, leading to the infamous dieting yo-yo effect. Everyone over the age of 40, and maybe even 30, can attest to this decline in hormones, with the resulting weight gain, and visible signs of aging. Hormones are significant when it comes to aging and fat loss because they control metabolism, and affect so many processes in the body. If you’re dealing with a slow metabolism, due to hormonal dysregulation, trying to lose weight will feel like an uphill ordeal. The premise behind Lean Optimizer is that it stimulates fat-burning genes, while optimizing hormones that control fat-burning. The end result is safe, long-term weight loss, minus the misery. In the chart below, you can see the functions of the fat-burning hormones in the body. Some hormones you’ll want to increase, like thyroid, leptin, and adiponectin, while decreasing others, such as cortisol, ghrelin, and insulin. It’s all about balance. In order to lose weight, your blood sugar and insulin need to be balanced. Leptin and ghrelin also need to be in healthy ranges to offset hunger and cravings, which result in self-sabotaging behaviors. High cortisol is responsible for a lot of nasty effects in the body, including high blood sugar and fat storage so keeping this hormone in an optimal range is essential if you want to lose weight. Healthy thyroid levels are also vital for an optimal metabolic rate, and fat metabolism. Lean Optimizer is the only natural remedy that promotes optimal hormonal levels so fat burning is possible. It was formulated by Dr. Sam Robbins, and one little pill works like five supplements in one to regulate the seven hormones responsible for burning fat. Ingredients include fat-burning hormone optimizers that balance levels of cortisol, estrogen, and adiponectin. Hormones are powerful chemical messengers whose effects can’t be underestimated. To illustrate their importance, think of all the menopausal women who put on weight before and after menopause. This is due to a hormonal effect, namely a decline in estrogen, which causes insulin levels to climb. Insulin is an anabolic hormones that causes weight gain, prevents fat loss, and causing cravings, derailing the best of intentions. Also, look no further to your diabetic relatives to see the disastrous effects of too much insulin, which leads to insulin resistance, metabolic syndrome, and eventually type 2 diabetes. 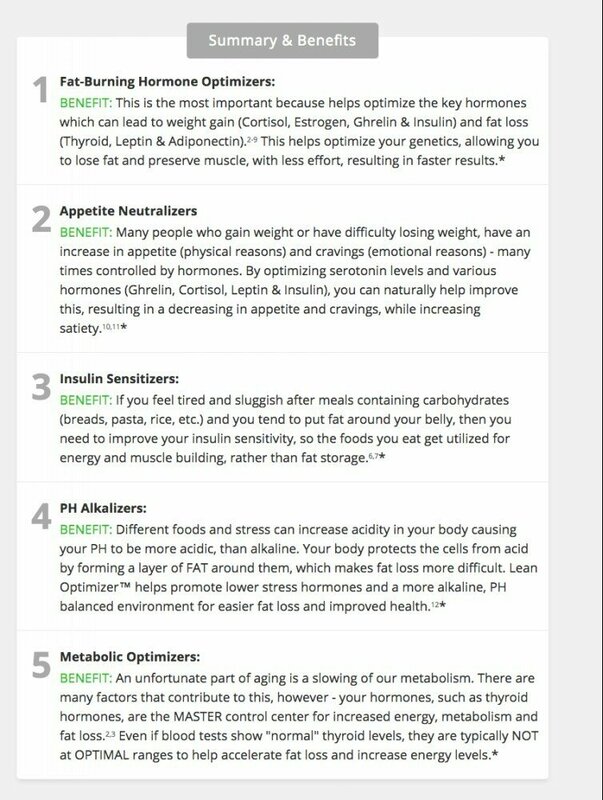 When insulin levels are optimized, appetite is often brought into balance as well. You can guess how much easier it would be to lose weight if you didn’t have nagging cravings or a raging appetite, the result of imbalanced hormones. Lean Optimizer also contains insulin sensitizers that improve insulin sensitivity and blood sugar levels. Food can then be used as energy, and to build muscle, rather than being sequestered into fat cells. Did you know that fat protects your cells from acid by forming a protective cushion around them? While this is a protective mechanism, it can stall weight loss. 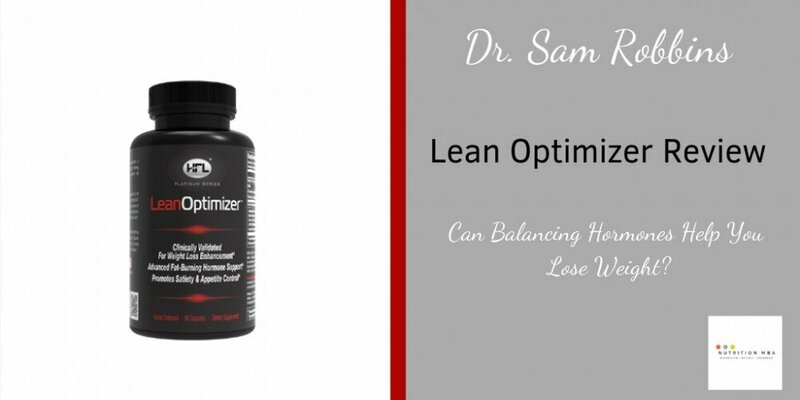 Lean Optimizer also contains pH alkalizers that lower stress hormones, such as cortisol, that lead to weight gain. Other ingredients include metabolic optimizers that boost metabolism. Metabolism slows with age, and when this happens you’ll feel tired, and won’t be able to lose weight. The thyroid gland is the master control center that controls energy levels and metabolic rate. When it isn’t working as it should, you’ll feel the effects throughout your entire body. Everyone should get their thyroid levels tested, and have the results read by a functional health practitioner. Normal ranges represent people with unhealthy thyroid levels. Patients who fall within these less-than-optimal ranges are considered normal. The truth is, their levels are nowhere near normal. Even small declines in thyroid hormone will lead to deleterious effects, one of them being an inability to lose weight. Who Is Dr. Sam Robbins? 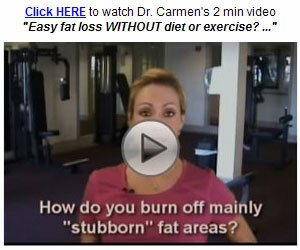 Dr. Robbins is an anti-aging physician who specializes in hormones. 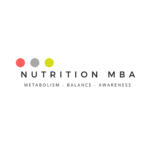 He is also a nutritionist, exercise physiologist, author, and entrepreneur. As the director of Health, Fitness & Longevity Institute, his goal is helping people worldwide achieve their health and weight-loss goals as easily as possible, and have fun doing it! It’s a fact, if strategies are too hard to implement, people will give up. Armed with this knowledge, Dr. Robbins set out to compress the copious amounts of information out there, into bite-sized morsels of wisdom his patients could absorb and apply. His passion is in endocrinology and anti-aging medicine, with a desire to prevent diseases associated with aging, allowing his patients to enjoy life more. Dr. Robbins became disillusioned with the current medical system that supports the model of seeing a patient for a few minutes, then promptly prescribing a drug to treat their symptoms. His desire was to address the root cause of why an illness developed in the first place. This desire led him to leave medical school, earn his Ph.D, and become a nutrition specialist and orthomolecular health practitioner. His underlying aim is to empower his patients to help themselves. This empowerment leads to patients that look and feel younger, are more vibrant, and live longer with less illness. Health is not only Dr. Robbins passion, but his hobby as well. Guggulsterones: Helps support the enzyme that converts T4 into the active thyroid hormone T3. Iodine: A mineral needed to make thyroid hormone. Iodine deficiency has been increasing in recent years. 3.5-Diiodo-L-Thyronine: Increases resting metabolic rate and fat burning. Sensoril Ashwagandha Extract: Offsets oxidative stress, increases energy and well-being, and supports production of thyroid hormones. 7-Keto DHEA: Reduces cortisol levels, increases metabolic rate, and increases levels of T3. 5-HTP: An amino acid that boosts production of serotonin, a vital brain chemical that prevents overeating, reduces cravings, and increases satiety. Theobromine: Reduces hunger, suppresses appetite, and positively impacts energy levels. Coleus forskholii: Lowers blood sugar levels, decreases appetite, lowers body fat, while increasing lean muscle mass. Citrus Aurantium/Advantra Z: An herbal extract that speeds metabolism, and blocks the activity of alpha-receptors in fat cells, leading to increased fat loss. Capsimax: Boosts metabolism, reduces inflammation, has antioxidant properties, along with anti-cancer effects. Paradoxine: Induces thermogenesis, which enhances fat burning and weight loss. African Mango: Suppresses fat production by increasing adiponectin and reversing leptin resistance. Meratrim: Contains two herbs that prevent fat cells from multiplying, while helping them burn stored fat. Green Tea Extract: Compounds within green tea increase levels of fat-burning by stimulating fat cells to break down fat. Green tea also helps the body burn more calories even at rest. LOWAT: A proprietary blend that decreases BMI. White Button Mushroom: An aromatase inhibitor, this compound reduces elevated estrogen levels, along with environmental estrogens. Chromium Picolinate: Improves blood sugar, insulin, and A1C levels by enhancing the efficacy of insulin. When insulin levels decrease, fat can be burned for energy, resulting in weight loss. Other ingredients include plant-derived cellulose gelatin and rice flour. I like that Lean Optimizer doesn’t contain magnesium stearate or food colorings like so many formulas do. If you’ve had it with trying to lose weight, and your frustration is through the roof, give Lean Optimizer a try. You have nothing to lose, except FAT. It comes with a 30-day money-back guarantee if you don’t see results, plus $100.00 cash back. While, it’s impossible to predict exactly how a product will work on individual bodies, this product is formulated by a brilliant doctor, backed by clinical studies, and the reviews tell the story, with hundreds of people reaching their weight-loss goals. You could be a success story too. Check it out here. Have you tried more diets than you care to count?